Motorcar mechanic Zaiyadi Ismail’s dream of forming a family band was not just a dream but a reality, when he formed Nada Akustika from zero in six months. The band from Kampar, Klang, who started off playing at schools and weddings and for free, have now about 250 performances under their belt over the last three years. The band started off with the five sibblings before Haqem was recruited, while Amer is still learning to play as the second violinist of the band, but sits in the band during performance to be exposed to the environment. “I saw an English movie (can’t remember the name) in the 90s where this family had their children perform as a band each time visitors came to their home. I was really fascinated by this and wished that one day that with my when I family, I could do the same,” recalled Zaiyadi on his desire to form a family band. “Diana had completed her Form Five examinations and I was driving home one day with her and asked her what she wanted to do, now that she had finished her studies. She said she was not sure. Diana said when her father popped the idea of forming a band, she was excited as she was the glamorous kind. “I liked to make-up and look glamorous. The idea of performing in a band, thus thrilled me to bits,” said Diana the vocalist of the band who specialises in classical and contemporary singing. Zaiyadi said that his only association to music was that he loves to listen to bands at outlets and records. Zaiyadi, 45, got his children to attend music lessons but insisted that each one play a different instrument. “Diana wanted to be the vocalist so I sent her for voice training, while I had the rest, Dini to play double bass, Danial (guitar), Ammar (cello), Nurkhairunnisa (violin), while Amer is the last member to the band but he is still learning to play the violin and sits in the band for experience,” said Zaiyadi who runs his own workshop from his home. 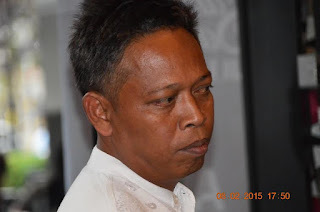 Zaiyadi said he spent RM80,000 to set up the band and a bulk of it went to his children’s music lessons. “I spent about slightly more than RM10,000 for equipment and PA system and rest went to the children’s classes to play their respective instrument and Diana’s vocal lessons. “When we first started to play as a band, our music was all over the place. But were determined to make it work and practiced harder. We did not go to a studio, but used our home hall as our practice area. And we still practice in the hall. Asked if the neighbours complained when they practiced, he simply smiled and replied: “They have come to like our music and they not only support us, but look forward to our practice sessions as their nightly entertainment,” said Zaiyadi who stays at Taman Setiajaya in Kampong Tok Muda. The band practices everyday except Tuesday which is an off day and on days when they perform, usually on Saturdays or Sundays. Diana said it was not easy at first. “Although we were all excited about forming a band, but training to sing or play an instrument required discipline and total concentration. While it was enjoyable at the beginning, there were times when it really got tough and we even thought of giving up. But dad kept encouraging us to be strong to realise our goal,” said Diana speaking on behalf of her siblings. “Our mum (Norhayati) too was very supportive towards us and kept encouraging us to stay focused. She is our number one fan and never misses our performances,” said Diana who sings in six languages – Malay, English, Spanish, Hindustan, Mandarin and Japanese. Soon after six months of hard work, Zaiyadi decided that they were ready for their first public performance and performed at Sek Ren Tok Muda for the retirement function of the senior assistant of the school and performed for free. 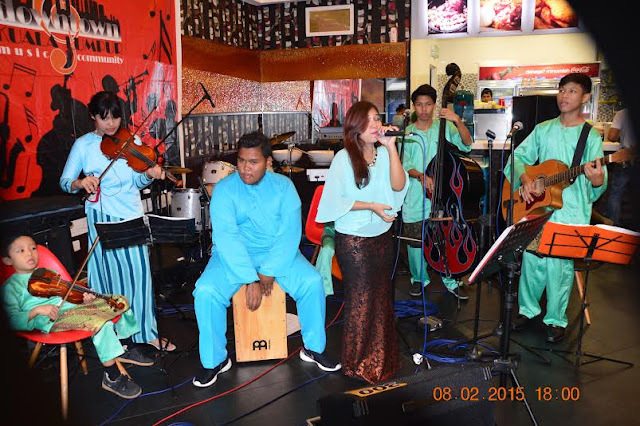 Their second performance was at a restaurant – Restaurant Nasi Lemak Kampar – close to their home. Zaiyadi said that their performance was met with approval for first timers on both occasions. “Our first paid performance was at the Ikan Bakar restaurant in Port Kelang where we were paid RM500,” said Zaiyadi who doubles up as the manager of the band. Today the band gets paid anything between RM 500 and RM3,500 for functions ranging from wedding to corporate function. Nada Akustika also has cut a single titled Warna Cinta and are working on their second album with Radhi O.A.G (Mohd Radhi Razali) from Sarawak who is an actor, singer and composer. The band’s biggest performance till date was at the 4th World Youth Jazz Festival 2015 at Jalan Mesui in April organised by the Jazz Community Malaysia. Their latest performance big performance was at the Downtown Kuala Lumpur Music Community’s last appearance at Sambal & Sauce in Nu Sentral on the first Sunday of this month. Dressed up in their turquoise Baju Melayu as it was a Raya performance, they had their audience on their feet with their vibrant performance. Playing twelve songs, Diana was an instant hit with her rendition of Zombie (Cranberries), Solider of Fortune (Deep Purple), Selamat Hari Raya (Rahimah Rahim), Pelangi Petang (Sudriman Arshad) and Suasana Hari Raya (Anuar Zain and Ellina) to name a few, while the band members mesmerised the audience with their talent and composed performance. “It is the aim of the band to go international to promote Malaysia and our music,” said Diana. “We hope to achieve this target by the end of the year to get an overseas stint or work with Tourism Malaysia to promote Malaysia through our music. Nurkhairunnisa attained 5 As for her UPSR examinations and speaks volume for their emphasis on studies. 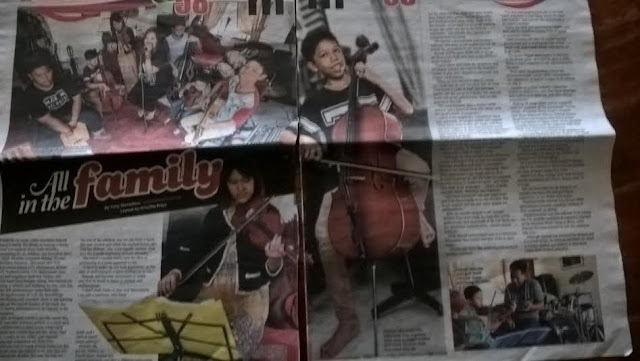 Nurkhairunnisa was also selected to be among the 131 member orchestra to represent Selangor at the National Music Camp in 2014, while Ammar has been selected to join the orchestra this year. Although Zaiyadi has achieved his dreams and is a proud father, he believes that the band can climb to further heights and intends to do whatever possible to see them realise their true potential.